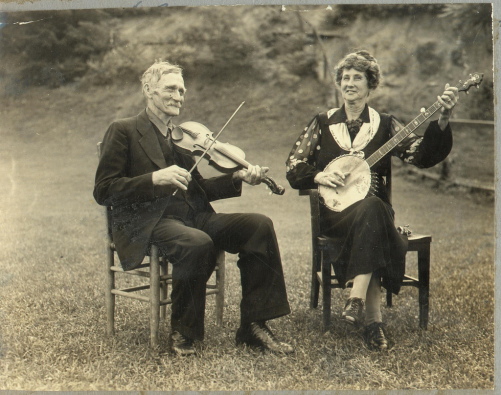 On December 24, 1960, fiddle and banjo player and old-time ballad singer Sarah Samantha Biddix Bumgarner died. Born in Tennessee in 1878, Bumgarner grew up in Dillsboro in Jackson County. Her father was the well-known fiddle player Has Biddix, and when he was not around Samantha used his fiddle to teach herself how to play. She also taught herself how to play the banjo. Bumgarner and Sylva’s Eva Smathers Davis made history when they recorded a number of songs for Columbia Records in 1924 including “Shout Lou,” “Fly Around My Pretty Lil’ Miss” and “Cindy in the Meadow.” They are credited as the first women to record country music. Known as “Aunt Samantha,” Bumgarner played at banjo competitions in the Appalachian region. For more than 30 years, she performed at Bascom Lamar Lunsford’s annual Mountain Dance and Folk Festival in Asheville. This kept Samantha in the public eye and she gained a loyal following. Her career bridged the traditional Appalachian music ways with the rise of modern country music. In 1939, Bumgarner was among a select group of mountain musicians who played at the White House for Franklin and Eleanor Roosevelt and King George VI and Queen Elizabeth of England.